Extra capacity Jumbo Jogger refills write twice as long as standard refills, up to two miles...always smoothly, clearly and with photocopy bank quality. Will fit most desk and pocket pens. 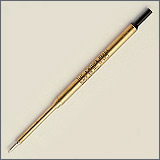 Carbide ballpoints assure skip free use.